If you haven't been tuning in to non-tech news lately, you may not be aware that Notre Dame Cathedral -- one of France's most well-known historical landmarks -- was recently the unfortunate victim of a major fire. Earlier today, the roof of the Cathedral was effectively an inferno, with massive plumes of smoke rising toward the sky. The blaze was visible from several hundred yards away. In some pictures that capture the devastation, the smoke can even be seen from the other side of the city. To say this incident is unfortunate would be a massive understatement. Notre Dame's history not only makes it a popular tourist attraction but also a major source of national pride for French residents. The Cathedral contains several artifacts and architectural elements that are likely already lost, or will be soon. Indeed, as reported by Yahoo News, the Cathedral's central spire has already crashed to the ground, wiping out "centuries of heritage." Fortunately, there's good news in the middle of the disaster, too. For starters, the fire is not suspected to be the result of foul play. 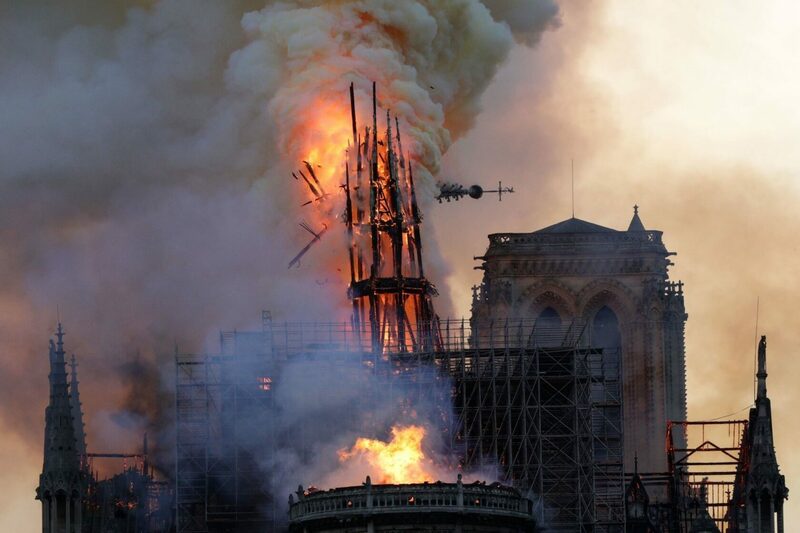 Second, firefighters have extinguished the bulk of the blaze and saved most of the Cathedral's remaining architecture. Finally, the damage that has been done already may not be too significant a loss in the long run. Thanks to the hard work of Dr. Andrew Tallon, Paris officials might be able to use 3D models of Notre Dame to eventually restore the landmark to its original glory. Tallon created a digital archive of the building in 2015 by using laser scanning technology. He has used this tech to do the same for numerous other Gothic cathedrals throughout the world. I had to set up a network of targets, which are just geo-located points in space. And you define the density of the scan, [the resolution of the scan], and then you let it rip. [The laser scan] sends out a beam and it measures the amount of time it takes for the beam to be emitted from [its laser device] to whatever it hits, and the time it takes to get back. The video below shows Tallon's process used on a different monument than Notre Dame (the Washington National Cathedral, however it showcases the same study he performed in Paris' historic landmark. Tallon's scanning tech can create extremely-accurate, "rich" 3D models of any given building. Though we don't have the specific numbers regarding his Notre Dame model, similar work Tallon has performed (such as his Canterbury Cathedral recreation) in the past involved a "five billion point laser scan" and roughly 100GB of stored data. Dr. Andrew Tallon's laser scanning tech in action at the Washington National Cathedral. Tallon's scans are so accurate that he may have discovered why some of Notre Dame's pillars don't line up: apparently, they could have been originally built around existing structures, which gives us some interesting insight into the building's past. Whether or not Tallon's work will be made available to future Paris restoration professionals remains to be seen, as he tragically passed away in 2018.